On behalf of BAYAN USA, Anakbayan San Diego joined the July 2 rally and press conference organized by the San Diego and Imperial Counties Labor Council at the Bayfront Hilton Hotel on while the secret negotiations took place inside. The event was the first of week-long actions that member organizations of BAYAN-USA took part to expose and oppose the TPPA. The rally also kicked-off a series of roundtable discussions and panels about the effects on the TPPA on the rights of workers, women, intellectual property, food sovereignty and the environment. On July 5, BAYAN USA joined panelists from the San Diego Maquiladores Worker’s Solidarity Network, the International League of People’s Struggle, and indigenous people’s organizations for a panel on Geopolitics and Empire followed by a discussion on Indigenous People’s Rights. On Saturday, July 7, 2012, member organizations of BAYAN USA joined allies and friends donning aprons and banging on pots and pans as they marched through the streets of downtown San Diego to the Bayfront Hilton Hotel calling to stop the TPPA. Allies, including members of the Asian Pacific American Labor Alliance (APALA), marched with the BAYAN USA contingent. Speakers from around the US condemned the TPPA, stating lessons we should have learned from NAFTA which led to massive migration of US industries for countries with less regulation and cheaper labor. Speaking on behalf of BAYAN USA, Ivan Penetrante denounced the TPPA and stressed the need for solidarity. Connecting the Obama administration’s public announcement to shift the US military to the Asia-Pacific region and the need to protect its economic interests, Penetrante highlighted the covert counter-insurgency tactics, including politically-motivated killings and abductions under the watch of the US-backed Philippine president Benigno “Noynoy” Aquino. “The Philippines is key to the TPPA and the US military pivot to the Pacific. The US already has the Visiting Forces Agreement (VFA) and are looking to re-open bases in the Philippines. Moreover, the US also funds, arms, and creates strategy for the human rights violating Philippine military. The US will need to enforce the TPPA with military might because the people will fight against it. People stood up against NAFTA, and they are standing up against the TPPA,” said Penetrante. 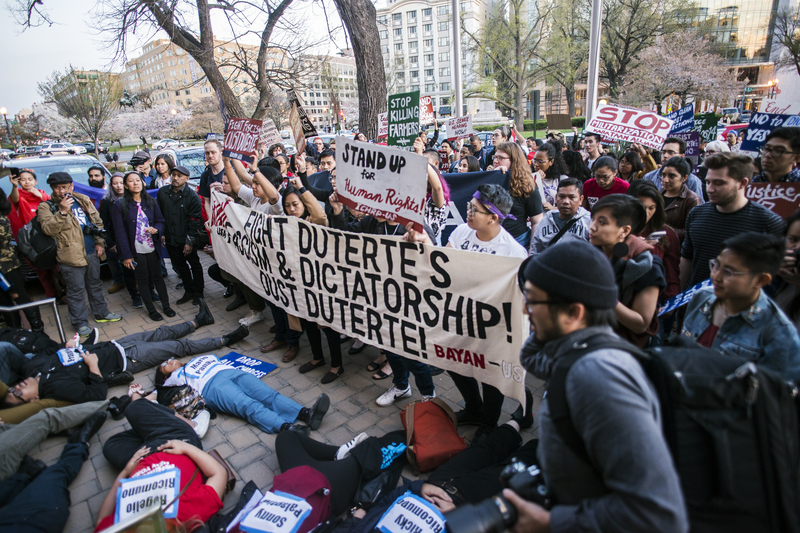 BAYAN USA continues to call on greater international solidarity between the American people and people of Asia-Pacific region against all forms of US intervention, including economic intervention through the TPPA.